While the great Ozploitation days of Australian cinema are now long gone, every couple of years we still seem to make a genre film that is proof to the world that we still know how to make these films well. Sadly though, nowadays these films barely seem to get distributed and only reach the smallest of audiences, meaning that the glory days of the 70's and 80's, where genre films were made at a regular interval in Australia, are never likely to return. The last great and overlooked Aussie horror film that came out was 2011's “Crawl” directed by Paul China, which was a brilliant study in suspense, and since that film came out, I have been looking for the next Australian genre film to knock my socks off. I have now found that film with Nick Robertson's “The Pack”. The plot of “The Pack” is simplicity at its finest as a farmer and his family have to try and survive the night from a pack of wild dogs who have entered their property and seem determined to viciously kill them all. Initially attracted to the farm by the sheep on the land, the dogs then turn their attentions to the humans that reside there. As you can see from the above synopsis, there really isn't a huge deal to the story of “The Pack” but the execution in telling this simple story is nothing but first rate. As is the norm these days in a horror film, “The Pack” begins with a pre-credits sequence that sees an elderly couple (who are also farmers) brutally attacked by the dogs, an attack that costs the pair their lives. From here on though, we spend the next twenty minutes getting to know the family who are going to be the stars of this film, the Wilson's. We learn that they are struggling financially, and as such both parents are working in an attempt to not lose their farm; a battle which appears they are losing. We are also made aware that the live-stock that are the main source of this family's income, are being cut down in numbers regularly by some sort of animal venturing from out of the nearby woods. Life is not easy for the Wilson's and yet they refuse to lie down and give in, and it is obvious that they all love one another, despite the tension this financial hardship is causing them all. By giving us this time with the family, director Nick Robertson makes us care for this family. We do not want to see them hurt and knowing how much they are already struggling, we want to see them succeed. They are good people and deserve to be happy. Following on from this opening twenty minutes, the film is all about suspense as the dogs circle and try to get inside the house to get at their prey whilst the Wilson's do everything in their power to stay alive. As great as the set up of the family is in the opening minutes, the reason for the success of “The Pack” has to do with the way the following hour is played out and handled. Robertson clearly understands suspense and how to get the most out of it, ratcheting up the tension until it is unbearable. I have watched “The Pack” twice now and even though I knew what was going to happen in my second viewing, I could not believe how tense I was whilst watching it. My fists were clenched and I was coiled up tight like a ball on my couch. When I realised this, I really understood just how brilliantly this film had been made and directed. In fact it is Nick Robertson's direction and Gabriella Muir's sharp editing that make the film so nail bitingly tense. Between the two of them, it is clear that they just know how to put together a story. There is no excess here, we are only given what is needed for the story to work and this benefits the film greatly. The film's myopic vision of the family's plight is all that the film is about, and that is what we get. Every shot seems to be perfectly chosen to compliment the next, and there is never anything show-offy here. Even the use of sound has to be highlighted as Robertson often drowned out the film of any sound at all, increasing the tension just before an attack would begin. I also appreciated the lack of any jump scares or cheap tactics to try and frighten the audience. All of his scares are well designed and earned. I especially enjoyed the scenes when you see the dogs approaching quietly in the distance, so that you knew they were around but never sure when they would attack. Speaking of the actual dog attacks in the film, they are handled magnificently throughout. The ferocity and power of these dogs is never in question. What is amazing though is just how few shots actually have the actors and dogs in the same space at the same time. Often times the dogs and actors have their own shots, but the way it has all been put together, edited and matched, you always believe that the danger they face is directly in front of them and thus your fear for these characters is very real. I have nothing to back this up, but from watching the movie I believe that they used a combination of real dogs, animatronic or puppet heads (for the close ups of the dogs biting at the actors) and on the very rare occasion, some CGI. Also when the human characters fight back against the dogs and beat, bash, stab or shoot them, they are very rarely in the same shot. It is action shot, and then reaction shot but again, it all works amazingly well and is incredibly believable. Another thing that is believable is the family dynamics of the Wilson family. There is no doubting that these people are an actual family. This is achieved by the very naturalistic performances of the cast, particularly Anna Lise Phillips as Carla, the matriarch of the family, and Jack Campbell as Adam, the father. Phillips is particularly impressive as although she comes across as someone who is frightened during this ordeal, she is still always a very strong character throughout. She never is the shrieking damsel in distress needing a man to save her, rather she is out there doing whatever she can in the moment to protect her family. In fact when it all boils down to it, she has a lot more success at it than her husband who always seems to get injured. I also very much liked Campbell's performance as Adam. He is definitely an alpha-male, a rugged farmer who isn't afraid of hard work and he comes across as a tough man. It is obvious he loves his family and kids, but isn't someone who goes easy on them. He expects them to pull their own weight too. He is a man of action, and not someone who would sit by expecting everyone else to do something instead. In saying all that, my favourite scene with Adam is a brief scene where he lets his rough exterior down for a second and shares a candle-lit dance with his wife. It is a beautiful scene that shows the love and tenderness between the two of them and is also the final moment of happiness before the terror of their night begins. As great as this film is, it isn't perfect (but what film is) but the negatives are rather minor. In terms of performances, I felt that Katie Moore, who plays Sophie, the teenage daughter of the Wilson's, came across a little wooden. I would never call her performance bad per se, as she plays a permanently pissed off teenager well, but I always felt her “acting” in her role where as everyone else comes across much more natural. Another (small) issue I had with the film is that for a film called “The Pack”, there was very little pack action when the dogs attack the family. I understand that when the minor characters of the film are attacked, the dogs all pounce as one, however when the Wilson's are involved the dog action is more one-on-one, which is a small conceit to give the family are better chance of survival. The other minor problem I had was that the conclusion of the film isn't entirely satisfactory in the fact that it just sort of ends. Granted I had more of a problem with this on my first viewing than I did on my latest watch of the film. Overall though, I found “The Pack” to be a stunning Australian horror film that is yet another master class in suspense. The film has been stunningly directed and performed and I also loved that the film had a strong sense of place. It just felt like Australia throughout. It is a short film, running only 85 minutes, but is endlessly entertaining and the re-watch factor is very high. “The Pack” knocked my socks off and I thoroughly look forward to whatever director Nick Robertson does next. 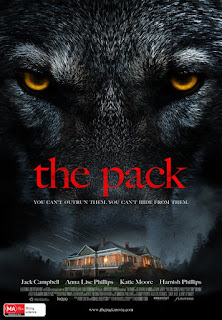 Here is hoping it is another horror film, because as “The Pack” demonstrates in spades, he clearly understands how to get the best out of the genre on very little.